Do you have a passion for the embroidery? Or you are a beginner, but want to learn? Then the initiative promoted by the University of the Third Age in Magione (PG), from January 19th to June 28th, 2012, is up your alley. The choice of Magione is not random: in the nineteenth century between the areas of Trasimeno lake the embroidery had expanded considerably, thanks to the efforts of many society ladies who opened schools and established courses, to allow profitable entrepreneurship. Often the fees came from royal families! The lessons will be held every Thursday afternoon, from 15:00 to 17:00, at the hall of the former Carpine cinema, and will be open to all. The "professor" is the embroiderer Maria Grazia Sedini. 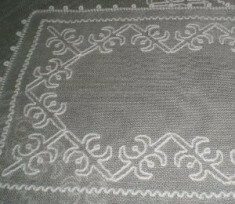 Experienced in many techniques of embroidery, will initially focus on the Punto Caterina dei Medici (also known as Punto Madama), a native of Umbria, not too difficult and accessible to everyone, but pleasing to the eye and satisfying for who is no good with this art. During the lessons will be possible to, for those who wish, try also with creative sewing: from patchwork to the creation of small objects. For registration you can contact the headquarters of the Unitre in Piazza Matteotti in Magione, or contact the course leader by phone: +39 075 8472784. © Punto Caterina photo: dolciericami.blogspot.com.